We are a Manufacturer and Supplier of Paper Corrugation Machine in India. We have been supplying our products to our customers from all over India. We have been giving service to our customers after sales. We are a Manufacturer and Supplier of Paper Corrugation Machine in India. We have been supplying our products to our customers from all over India. We have been giving service to our customers after sales.Suitable for converting paper into corrugated 2ply rolls.The machine is fitted with two set of flute rolls, self loading reel stand with reel shaft. 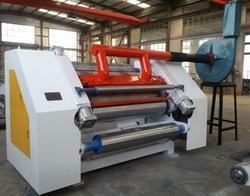 The upper-lower corrugating roller are made of 52CrMo high quality alloy steel after heattreatment. The hardness HRC58-60the surface is been grinded.